You and your family will love staying in this beautiful three-bedroom, three-bath home nestled on the banks of Lake LaVista, just one block north of Pine Avenue in the village of Anna Maria. Everything you're looking for in a vacation rental home is right here...a lovely view, a large heated pool (pool heat is extra! ), updated kitchen and bathrooms, lots of privacy, and super easy access to our island attractions! With over 2100 square feet of ground-floor living space, you'll have plenty of room to relax and enjoy your surroundings. The large dining room table is the perfect spot for family gatherings, and the expansive, well-equipped kitchen will make it easy for everyone to pitch in when it's time for meal preparation. Two bedrooms and one bathroom are located down the hallway and can be closed off for additional privacy, while the master bedroom features a King Bed, an en suite bath, private patio area, and beautiful views over Lake LaVista. Although every room in the house is beautifully decorated with coastal design, the prettiest part of this house is, without a doubt, the large backyard. Loads of windows and sliding glass doors provide a terrific view from most rooms, along with easy access to this inviting oasis. The large heated pool is child-friendly with a shallow area at both ends. And stretching the length of this extra-large property is Lake LaVista, a beautiful meandering waterway that leads out to Tampa Bay. The property has a boat lift that is available for use as well as a dock. Boaters, please keep in mind that the one fixed bridge between the house and Tampa Bay allows only a 7 foot clearance at high tide. 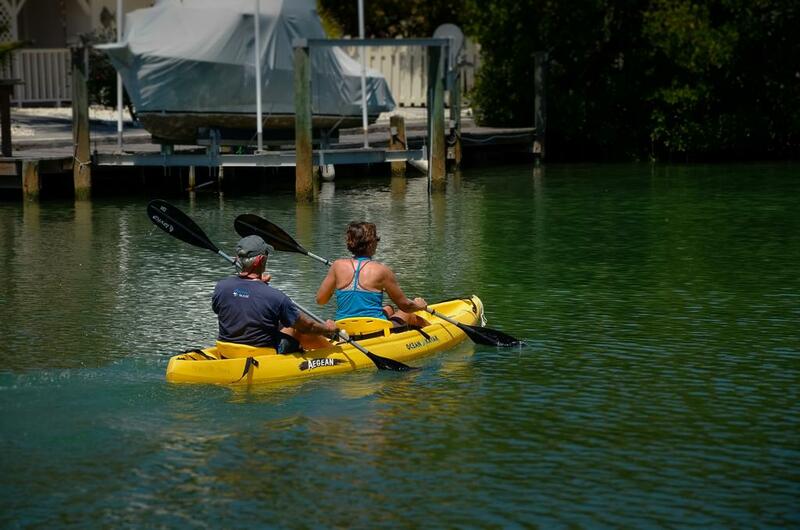 When you're ready for the beach, an easy walk or bike ride will take you to the Sand Bar Restaurant by the Gulf, or to the Historic Anna Maria City Pier near the Bay. You'll find shops and restaurants en route, along with the Anna Maria Community Theater and the Anna Maria Historical Society Museum, as well as fun street festivals several times a year. A stop for the free Island Trolley is just at the end of the street when you're ready for adventures a little further down the island! Sleeps 8 in beds, but there's plenty of room if you'd like to have www.FunandMoreRentals.com bring in a couple of rollaway beds for the kids. Need more room? Rent the adjacent property, Lakeview Cottage, to accommodate 4 more people. Please ask our staff for details! Peaceful waterfront home with every amenity! 5 Stars!!!!! Lovely home on the lagoon. (Lake La Vista) Relaxed at the water’s edge each morning drinking coffee while watching the egrets, herons and other unique birds. Beautifully landscaped property. Pool is large and water temperature perfect. Family visited for several days and the large, well equipped kitchen was a chef’s dream; we enjoyed creating several wonderful meals. These hosts have thought of everything we could possibly need, thank you! Best FL rental ever and we look forward to coming back. Outstanding property. 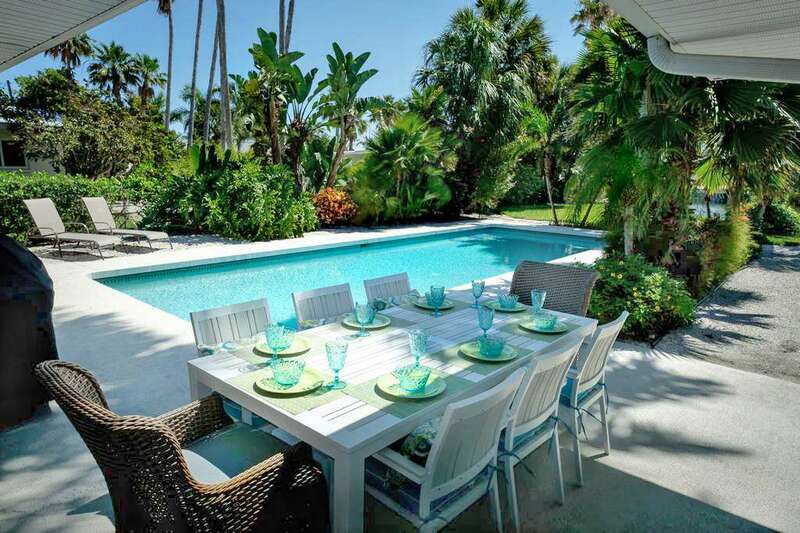 Perfectly located, well appointed, beautiful views on the canal and probably the best pool on Anna Maria Island. Easy walk to downtown Anna Maria and the beach. A wonderful two weeks. Very nice and fully equipped house. Big pool and great backyard. Close to the village and the beach.